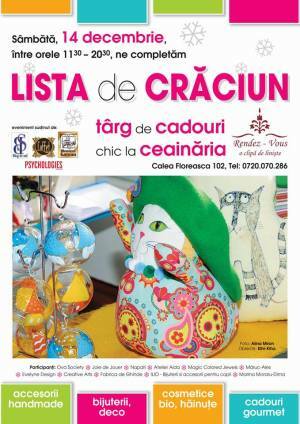 The Christmas List Fair takes place at Rendez-Vous, a cozy teahouse in Central-northern Bucharest. The fair waits for you with cakes, holiday flavor teas and fancy gifts ideas for your beloved: jewelry, handmade accessories, decorations, children apparel and toys, bio cosmetics and gourmet products. "The Christmas List" Fair in Bucharest. You can get here description, reviews, address, time and details of "The Christmas List" Fair in Bucharest. Visit Bucharest Tips for more Fair events in Bucharest!